The EZA Community Top 25 Best of 2017! 2017 was a hell of a year with many, many games deserving of a shout-out, but the people have spoken and narrowed down the list to a Top 25. 54 lists, 83 games nominated, this is more than last year so thanks a lot to all of you! As usual I'll reveal one game a day, so strap in! I'm not for horror, so I passed on the Evil Within 2, however, I really dug the trailer (and the music) from its E3 reveal and the bonus Trailer Jones breakdown during the E3 coverage. A lot of of Honorable's huh? I didn't really think about it, but I've got a feeling that category will play a massive role in the reveals. While I'm not really a horror game kinda guy, it looks like a good one! Wow, I'm surprised its not higher.. guess it speaks to the quality of games released this year. Yeah they do add up, I think it helped some lower-profile games get a bit higher in the rankings. My underdog this year is Pyre. If it made it on the list, I will be very happy. I never feel right about putting games I haven't finished on my top X lists but I'm more than willing to give 'em honorable mentions. In fact I think I only finished one of my HMs this year. I know one of the games on my list will probably go far and I'm more than willing to bet another one won't show up at all but as long as the other two make it into the top 10 I'm happy. @Faaip Hadn't even heard of that. Launch trailer is good. Might pick it up sometime. It's a pretty damn awesome game with a ton of atmosphere. A lot of games can learn from it's combination of weapon arsenal, limited resources, and the actual space your fights take place within. This goes before mentioning how the enemies are contextualized to the world which not a lot of horror games do. However, it isn't as good as the original and it doesn't play to its strengths with tedious open world sections. If it was as unique as the original, it would certainly be in my top 3. Amazon germany currently has a 3 for 2 sale on selected games and this was one of the games I had on my list I compiled out of all available games for that offer, but decided against it as I yet have to play the 1st game which is in my backlog. I heard good things though. 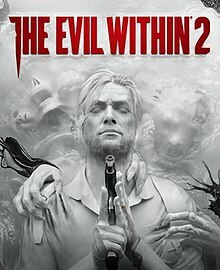 I liked Evil Within more than 2, never understood the complaints of the first game. So we have started! Im really looking forward to the list of this CRAZY year! may the best game win! I played 24 games in 2017, with only a handful of them being from years prior to that, so I had a pretty tough time making my list. While I didn't enjoy the story/so on of Evil Within 2 as much as the first game, just going around scavenging for stuff and killing freakos just felt too good to not give it at least an honorable mention. Great game, enjoyed the story mode, the towers but that online multiplayer sucked balls.